We greet you with love and joy on this holy Feast of the Theophany of our Lord and God and Savior Jesus Christ. The Apolytikion of the feast which is quoted above transmits to us the essence of this feast. 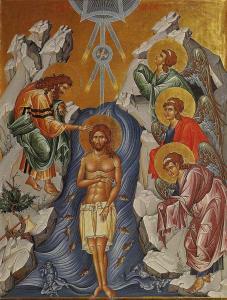 Our Lord and God Jesus Christ deigns to be baptized at the hands of John the Baptist, not because he is in need of cleansing of sin, for He is without sin, but so that He might reveal to us His true identity and at the same time, honor and affirm the new life that comes through baptism. In this feast we see the Holy Trinity, God the Father, God the Son, and God the Holy Spirit, manifested to us in dramatic fashion. The voice of the Father expresses His pleasure with His Son, and the Holy Spirit descends upon the Son in the form of a dove which is also significant because the dove is a symbol of peace. Our Lord reveals His true identity to us for the first time as He begins His earthly ministry, and immediately departs for a period of fasting into the wilderness where He utterly defeats the feeble efforts of Satan to tempt Him into sinfulness.